Earthy. Poppy. Raw. Polished. Bluesy. Rocked out. Electric. Folky. Just when you think you have this album dialed, each song successively surprises with variation and nuance. 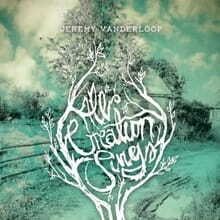 Singer/songwriter Jeremy Vanderloop presents his third studio project, All Creation Sings, which parallels the “eager expectation” of God’s creation to be with Him again and “pour out love.” If pressed to sum up the content in this collection, it would be safe to say that all 12 tracks have recurring themes of life, light, and love. The project begins with the upbeat “Illuminate the Sky” which commences Vanderloop’s varied takes on the concept of life and what its purpose is. For instance, he urges listeners to “Illuminate the sky with our lives,” then the next two songs are entitled “Life is a Canvas” and “Let Our Lives Sing.” Vanderloop certainly has something to offer in that he sincerely and earnestly tries to draw listeners’ attention to something/someone greater than themselves. He also pulls content directly from scripture (“His Prize”), and brings a simple and worshipful chorus to the table with “Heaven’s Drawing Me.” Throughout this project his tone is often reminiscent of the Psalmist, portraying an ardent, but yielded man crying out for God (“The Struggle,” “Redemptions Way”). This album conveys a sound message and sound musicality. However, Vanderloop’s voice may not be music to everyone’s ears; it might be more of an acquired taste. His delivery is passionate but the tonal quality often fluctuates both in terms of phrasing and pitch, which could be frustrating for some. Yet, this is certainly not the rule, as in the standout track “Poured Out”— perhaps the most notable and poetic of this collection. Vanderloop delivers a well-constructed, artful, finished product that is both intriguing and well engineered. Seasoned fans will be satisfied, and perhaps the album will garner some new ones. Since he’s still early in his career (and life, he is only 24!) there’s plenty of room for his obvious talent to grow and blossom.